Since the time of our forefathers, curing and preserving meat to make biltong and droëwors has been part of our heritage and culture. In the olden days, biltong and droëwors were made primarily as a means of survival, rather than the delicious snack it is known to be in this day and age. During the olden days, this preserved meat was made to be consumed during the long journeys that our forefathers took across the South African plains. 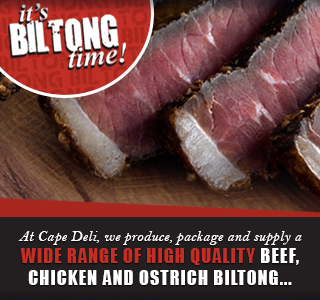 Curing fresh meat into biltong by curing and preserving the meat in the traditional way was of absolute necessity, seeing as the modern day refrigeration technology we now use to preserve our perishable goods were not available in those days. 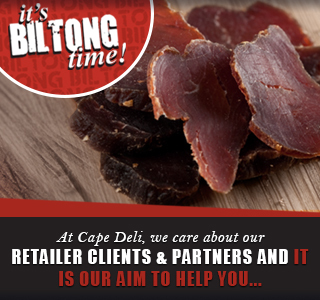 Today, biltong is known throughout the world as being a traditional South African delicacy, enjoyed by millions as an easy, protein rich snack and of course as a delicious favourite social treat. 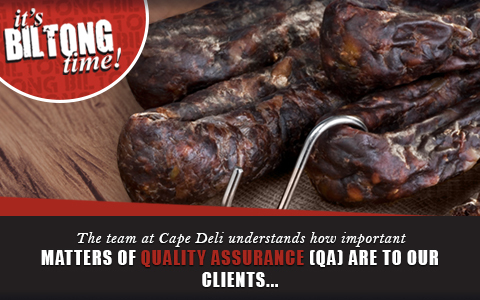 Cape Deli – An innovative team of people delivering delicious, top quality products! 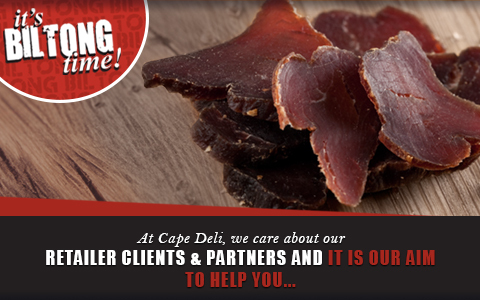 The team at Cape Deli are proud to say that we are experts in producing traditional biltong, droëwors and related products in the authentic South African way, and over the years, we have perfected the art of making this true to our heritage. 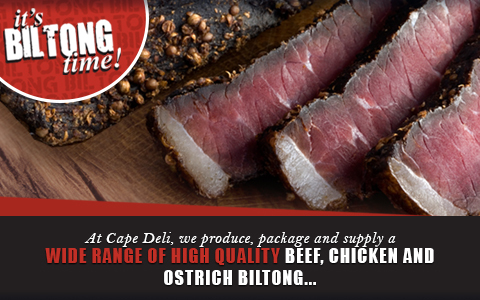 Cape Deli is well known for producing some of the finest quality biltong and droëwors products available in South Africa today. 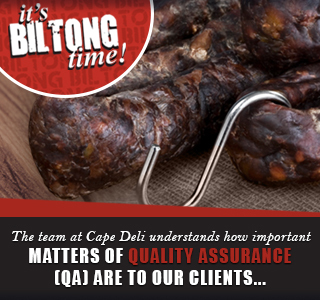 What makes our production technique so unique is the fact that we are able to produce large quantities of quality biltong, droëwors and related products according to various traditional recipes. 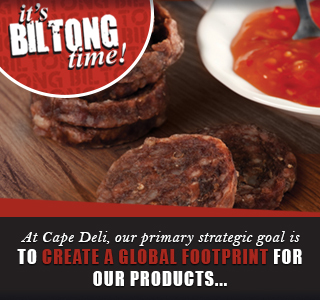 The products we produce include biltong, droëwors, snapsticks, biltong powder, biltong wheels, etc. To spice things up, these products are available in an assortment of flavours, including plain and chilli. Click here to view our products page. Not only are we able to produce the above mentioned products in large quantities, we also have a fast turnaround time in the production of our products. We are able to complete standard orders within 48 hours, while non-standard orders that require processing from wet delivery can be completed within 7 to 10 working days. 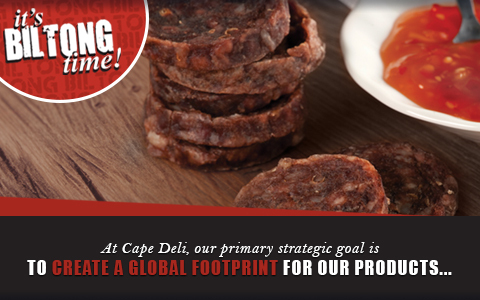 To ensure the safety and longevity of our products, Cape Deli has invested extensively in the latest food packaging technology, namely Modified Atmosphere Packaging, or MAP packaging. MAP packaging refers to a specific technique that involves packing perishable consumable products into packages that contain an optimal level of nitrogen, carbon dioxide and pure oxygen. We always deliver products of consistent quality. Our products are available in various package sizes. Our products are extremely popular and are available in most supermarkets and retail outlets. Our products come in a variety of flavours. We make use of the latest technology in packaging (MAP packaging). We are the leaders in the industry when it comes to new product and packaging development. We are able to cater to our clients’ custom product and packaging needs. We are truly passionate about biltong and droëwors, and we make it our business to always produce quality products that will never cease to impress even the most critical connoisseur.